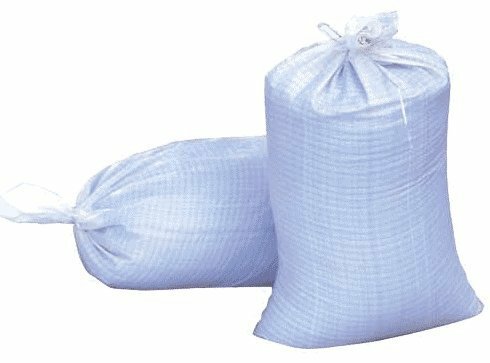 Sandbags are an often overlooked prepping item. In a Doomsday survival scenario fill these empty sand bags with sand and use them to fortify strategic defensive positions against gun fire. They have other uses such as building a shelter, stopping floods, and protection against radiation in a nuclear disaster. See the video below of a sandbag versus a full magazine of AR15 rounds fired into it plus other caliber bullets. In a Doomsday survival situation, if you are defending your home or Bug Out Location against marauders, you will probably have many defensive positions that you would like to protect as much as possible against gun fire. Sandbags make a great solution to build a barricade that also protects against nuclear radiation, flooding, wind, and provides insulation. See the YouTube video below to visually see how extremely effective sandbags are at stopping various caliber bullets. The additional reading (link) below shows one man's testing results firing into sand filled (sheet rock) walls with many different types of pistol and rifle rounds and a shotgun slug. As an example, a 5.56 XM193 Round fired from an AR15 disintegrated within the first 6" sand filled wall during his testing (read his article for more details and pictures from his testing). I personally have a couple of thousand empty sandbags, and have plenty of sand ready to be used if needed. Well-constructed fighting positions and bunkers covered in sandbags can provide excellent protection against a nuclear detonation. Radiation has great penetrating power as it scatters in all directions after a burst. Each 4 inch layer of sandbags, if filled with sand or compacted clay, reduces the transmitted radiation by a factor of eight. The Table below shows the protection for using one to three layers of 4" thick sandbags for a hypothetical free-in-air radiation dose of 2,400 cGy. Sand or compacted clay gives better radiation shielding than other soil types because it is denser. Each layer of sand or clay filled sandbags can give up to 66 percent more radiation protection than the same thickness of other soil type filled sandbags. Pack and wedge the sandbags against each other to avoid cracks between the sandbags to prevent radiation leakage. Protect sandbags from exposure to thermal and UV radiation. If building bunkers / fighting positions outdoors that utilize sandbags, cover the sandbags with a small amount of earth and / or sod to eliminate exposure to sun and heat. Covering sandbags also enhances camouflage and provides valuable additional conventional protection against gun fire and mortar fragmentation. A sandbagger shoveling tool makes the filling the sandbags a lot easier (see the recommended accessories below). These Woven Polypropylene Sandbags need to be protected from the sun, so after stacking them, cover them (if possible) if they are not shaded. Otherwise they will begin to tear and come apart when handling them again after extended exposure to the sun. "These types of bags are great. However, those of us who use them often know they must be protected from the sun. You simply cover them with an earthen plaster. We use these to build earthbag homes." "They work great but only last about 3 to 4 yrs if exposed to direct sun." "I've ordered a set of these as well as my Dad. The bags differed slightly between the two but functionally were the same. I filled and placed over 200 over these bags and only 1 had a small rip. The bags seem to be holding up well for the past 4 months including the ones with exposure to a bit of sunlight." "'I've purchased a few hundred of these do far and do plan on buying more, unless I can find better quality. These bags do hold the sand, but they're easy to tear after setting out in the elements for a few weeks." "....My application required filling numerous "14x26 Woven Polypropylene Sand Bags with Ties & UV Protection". I chose to use Amazon's "The E-Z Bagger" which is an invaluable tool and works superbly in two ways. One way the E-Z Bagger works is as shown on its product page on Amazon: the E-Z Bagger product image shows the "square end" is in the sandbag, and the "rounded end" (which you can not see) is scooping the sand. This application works okay if you do NOT have a shovel or other tool with you, AND the sand bag opening is large enough to fit the bended E-Z Bagger into it. I found that my technique works better for the well-built 14x26 Woven Polypropylene Sand Bags with Ties & UV Protection. Using a mil-spec military style shovel (collapsable to fit in or on a backpack), I found that the best method for me was to REVERSE the position of the E-Z Bagger...."
The following YouTube video demonstrates various caliber bullets and how the common sandbag stops them all, even a whole magazine round. Sand is a very good barrier. Nothing we shot penetrated more than 6 inches into the sand. Does that mean I would hide behind 6 inches of sand and let someone shoot at me? No way!! I’d rather have 60 feet of sand in front of me. But 6 inches seems to work pretty well for the rounds tested. To our surprise, the pistol rounds penetrated deeper than the rifle rounds. Why? The pistol rounds held together better as they were ball and didn’t have enough velocity to break them apart. Therefore, they held together and penetrated better. The rifle rounds were traveling at such a high velocity that they broke up into pieces and this stopped their penetration quicker. The 12 gauge slug finally met it’s match with sand. The soft lead slug was flattened out and stopped quickly. The .45-70 hard-cast bullet penetrated a little better than the soft lead slug, but not a lot. And the sand tore it up pretty quickly. And lastly, sand is a good barricade material.